This seasonal beer offers a synergistic combination of two classic German styles, Oktoberfest and wheat beer; a surprising alliance that works very well together. Cloudy body with some amber hints. The head is frothy, pleasantly white and with a soft texture. Lacing starts with a series of rings but soon breaks into abstract art as the glass progresses. Residual carbonation is very lively. The wheat aroma with a fruit and clove hint combines with a strong malty flavour at the back . 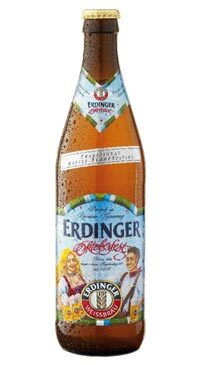 ERDINGER Oktoberfest blends the advantages of our well known wheat beer with the traditional Oktoberfest taste. A grainy flavour and lovely hoppiness. The feel and crispness of our wheat-based speciality with an Oktoberfest body.